Museum Location: American Art Galleries, 5th Floor, The Americas’ First Peoples, 4000 B.C.E.–1521 C.E. 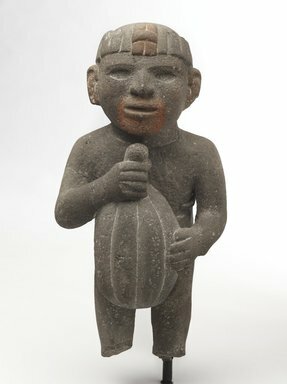 Figure of a man carrying a cacao pod. Left hand holds stem attached to top of pod; right hand rests on middle of pod. Eyes and mouth are open. Traces of red pigment are visible around mouth, ear and central ornament on figure's headdress. Figure wearing traditional loincloth (maxtlatl). Right arm is cracked and repaired; feet are broken off; small section of stone on finger near knuckle of right hand is missing; some surface chipping overall.